In regards with this topic, a lot of events and workshops were organised, stressing the major role of combined transport as the most sustainable and environmental friendly transport mode. This year’s highlight is undoubtedly Noah’s train, launched by the Rail Freight Forward initiative (1), in the context of the COP24 with the objective to increase the rail freight volume to 30% by 2030. 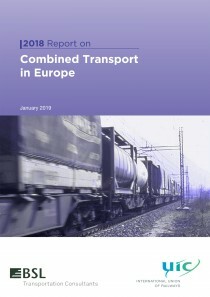 This 7th edition of the Report on Combined Transport contains a focus on the European CT-wagon fleet including actual figures but also the expected trend by the year 2025. These holistic figures, demonstrate the vitality of the sector through the high level of investments foreseen in this domain. In the coming years, the business model will likely change to a more integrated and digitalized logistic chain in which the Combined Transport will become the commonly accepted mode of transport, adding up flexibility, sustainability and lower carbon footprint. Many thanks to the members of the UIC Combined Transport Group, our partners and the CTwagon fleet stakeholders and manufacturers for their input to this valuable biannual report.